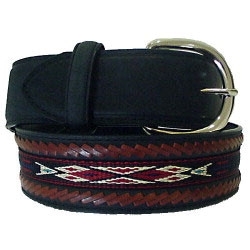 Silver Creek Laced Edge Horse Hair Ribbon belt is brown or black leather with a native American style horse hair ribbon center, laced edge. Buckle is silver plated. Measures 1 1/2".